It staged a strong comeback after the last launch in 2004. Since then, supply is set to double and more. The total EC units under construction including recent land sales, launched in less than 2 years, is now about the same as the existing completed supply, where it took over 10 years to sell and build. An Executive Condominium (EC) is essentially a hybrid between a private property and a HDB flat. New units come with ownership and resale restrictions such as a household income of not more than $12,000 and a Minimum Occupation Period (MOP) of five years. 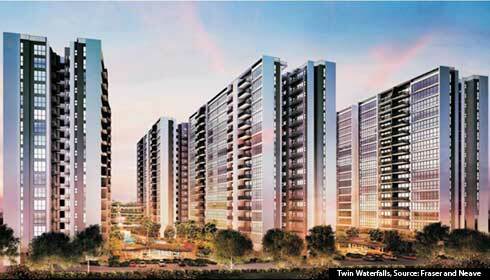 During the 6th to 10th year after completion, units can be sold to Singaporeans or PRs with no family nucleus requirements (Partially Privatised). After 10 years, all restrictions are lifted (Privatised). On the positive side, buyers are eligible to certain grants. Against this backdrop, new EC units are currently sold at about 20-30% discount compared to nearby new private properties. We expect the discount to start narrowing once the units are allowed to be sold after the 5-year MOP, and eventually priced like private properties once they cross the first 10-year period. See two examples below where this is true. We have picked a pair of properties (one EC and one private property) in each case with the same tenure, same completion date, and approximately the same distance away from the area's main amenity, the MRT station. While an EC might be a good option for genuine owner-occupied buyers who are prepared to stay for at least 5 years, do take note that generally, the construction cost (may reflect the quality of the project) for an EC tends to be 20% lower than that of a private property. A list of all the ECs is given below. More than half of the completed ECs have been fully privatised. Most of the other half are in their 6th to 10th year. La Casa remains the only EC currently that has yet to cross the initial 5-year MOP. This is due to a vacuum period of about 6 years (2004 - 2010) with no new EC developments. The priciest EC is Bishan Loft, where units have crossed the $1,000 psf mark. Note: *Prices and rentals are based on data in the past 6 months.